INTERACTIVE DIGITAL SIGNAGE serves many purposes and the possibilities for interactive hardware and software solutions are endless. Digital Signage is actively being used everywhere you look! It can already be found in schools, transportation systems, museums, stadiums, retail stores, hotels, restaurants, and corporate buildings. Be it a point of sale, a shopping portal or a table side menu – interactive digital signage hardware and software is used by businesses to personalize these user experiences. Interactive technology shifts the focus towards the consumers, giving them the power to access and display the information they want and need in real-time. Consumers are already used to the intuitive control of digital content with simple touch gestures. There is no barrier at all to adapt or learn something new. Interactive signage can: Answer questions, give directions, help with reminders, and it allows the user to quickly access important information. 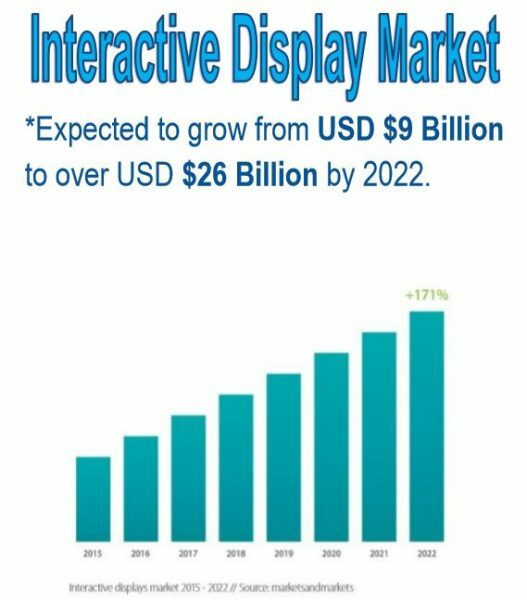 The interactive displays market is expected to grow from USD $9.9 Billion in 2015 to over USD $26 Billion by 2022! It is certain that more and more businesses will be embracing the new trend and using it to their advantage.